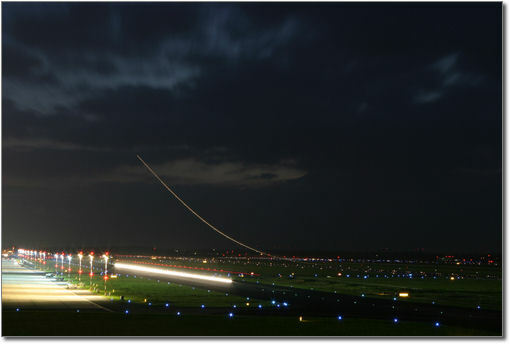 "When flying an ILS approach at night, is it a good idea to follow the glideslope below decision altitude, or should I ignore it once I have the runway in sight?" - Drew W.
"The glideslope on an ILS approach can serve a useful purpose below decision altitude of an ILS approach, because it can provide approach guidance over the runway. The glideslope itself emanates from a point adjacent to the two big white boxes painted on a precision instrument runway. Following the glideslope all the way down to these white boxes will bring you to a point about 1,000 feet beyond the runway threshold, which is a very safe place to touch down. Staying on the glideslope keeps you safely away from the approach lights or other obstacles. To stay on the glideslope until safely over the runway requires that the pilot avoid diving to the threshold and, more importantly, that the pilot avoid retarding the power when breaking out - whether at DA or above. Remember that decision altitude typically occurs about ½ mile from the runway threshold at an altitude above the ground of only about 200 feet. When going visual, make only minor adjustments in power and stay on the glideslope until actually over the runway."